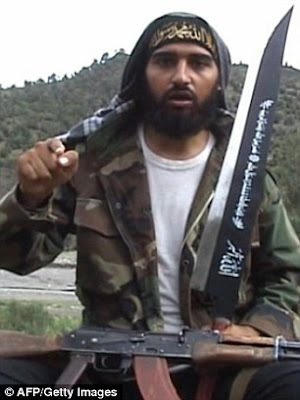 GERMAN JIHADI WITH 2-FOOT BEHEADING KNIFE INSCRIBED WITH KORAN VERSE……. – The Tundra Tabloids……. GERMAN JIHADI WITH 2-FOOT BEHEADING KNIFE INSCRIBED WITH KORAN VERSE……. Obama’s Nobel Peace Prize has just served to increase their growing confidence. The Europeans are trying to reward and tie Obama into their pacifist agenda for the “new world” order. With such growing enthusiasm for an appeasement in the halls of Europe and in the ranks of the US Democratic party, it shouldn’t come as a surprise that the US/West’s enemies are feeling… a bit hopeful. An Al Qaeda fanatic who trains fellow Europeans to fight in Afghanistan has given a stark warning to our troops – by posing with a 2ft-long beheading knife. The bearded terrorist, identified as ‘Abu Askar the German’, belongs to one of Osama Bin Laden’s ‘foreign legions’ fighting alongside the Taliban. In a new terror video posted online he vows to ‘achieve a victory for Islam’ using the huge blade, which is inscribed with an Arabic passage from the Quran. In pictures designed to scare British and American soldiers is also seen sitting with an AK47 rifle. Terrorism expert and author Chris Dobson told The Sun: ‘The bloodthirsty threat of Abu Askar the German and his giant cleaver is plain – anyone who opposes us will lose their heads. ‘Fanatical Islamic Jihadists have a record of beheading captives and boasting about it to cause fear among their enemies. Previous Post Previous Post MOSQUE-HOPPING IN GERMANY WITH ROBERT SPENCER AND ESW……. Next Post Next Post BOLTON TO OBAMA: GIVE THE NOBEL BACK…….